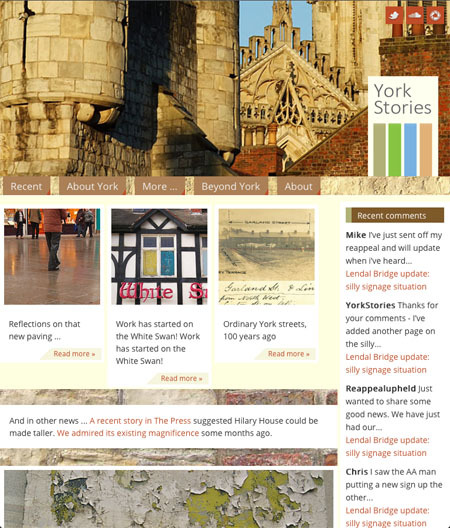 You may have noticed that York Stories looks completely different. I hope it looks like an improvement. It should look particularly different if you’re viewing it on a tablet or laptop, perhaps not so different on the small screen of a phone, but I did my best on that too. If you notice anything disastrous – ie it has collapsed into an unreadable mess, please let me know, as I can’t test it on all devices and browsers. More important, probably, than how it looks, there are several improvements I’ve been wanting to make for a long while. I couldn’t bring everything into the new design. The oldest content, from 2004, has been left as a self-contained archive from that year. Which, of course, is almost a decade ago. Long time. I’ve carried on with this website because I think it’s important to have this record of York from a resident’s point of view. Increasingly of course it’s not just my point of view, it’s yours as well, via the comments. With everything that is happening in York at present there’s a lot to comment on. And of course many small details and ordinary things to focus our attention on too. I still keep finding things I’ve never noticed before. I hope you find the new setup an improvement. I’ve things still to do, some issues I hope to sort out, but it’s over a month now I’ve been working on this and I want to get these pages open for comment without further ado. By Lisa @YorkStories • 9 December 2013 Web/website matters To link to this page's proper location please use the > permalink. Well done you Lisa indeed,Enjoyable,Interesting and Refreshing.Must have been darned hard work!! Particularly at around 1am when the browser kept telling me that my 301 redirects had resulted in an endless loop that would never complete … Sorted now I hope. Can now get on with photos, words, that kind of thing. Thanks again for your support. Fantastic work Lisa! I’m amazed at the depth of your research on historical and contemporary issues. You must have a team of elves helping you! Keep crackin on with the work. May I wish you and your family a Happy Christmas and peaceful New Year.